It is 21 May 2017, and time for the Season 3 premiere of Twin Peaks. This review assumes that the reader has either already viewed the first two seasons of Twin Peaks, broadcast back in 1990 and 1991, or does not remotely care about having key plot points from those seasons spoiled for them. I have recently reviewed Season 1, but not Season 2. Keep an eye on the blog titles to ensure you know which season I am reviewing in any subsequent review, as I will likely be jumping back and forth between Seasons 2 and 3. 25 years later in New York City, South Dakota and the small town of Twin Peaks, mysterious events occur. That is pretty much the only synopsis you need. It is a pretty remarkable thing to return to a series after a quarter-century and simply pick up the story from where it left off. Twin Peaks Season 3 runs a tremendous risk of being the single-greatest piece of 'inside baseball' in television history. Sure the series was very popular when it first appeared, but that popularity dropped like a rock during its second year, and the things the mass audience seem to recall about Twin Peaks are not really the most accurate reflection of what the series was really like. People remember Bob, the Black Lodge, the Man from Another Place, and the Log Lady. They do not necessarily remember the soap opera parody, Piper Laurie in yellow face make-up or Nadine Hurley joining a cheerleading squad (I think she did that - I actually haven't rewatched Season 2 since it first came out). This first episode of Season 3 does not make things easy for new viewers, but I think it is important to note that it doesn't make things easy for old viewers either. For the nostalgic there is little in the way of returning characters. Dr Jacobi (Russ Tamblyn) has a brief scene, receiving a delivery of shovels. The Twin Peaks sheriff's department get a short look-in, minus Sheriff Truman - Michael Ontkean declined to return. Hawk (Michael Horse) receives a message from the Log Lady (Catherine E. Coulson, who died shortly after filming her scenes). And of course there is Agent Dale Cooper (Kyle MacLachlan), still waiting in the Red Room while his possessed body runs rampant elsewhere. Beyond that, the episode throws out all new characters and an all-new story. In New York a young man has been hired to watch a large glass chamber in the middle of some anonymous skyscraper. In South Dakota a woman is found murdered - except her head has been severed from her body and the body now attached to her head is not hers. Elsewhere the physical Dale Cooper - now a long-haired criminal in a snake-skin pattern shirt, collects two young accomplices for a criminal enterprise. It is all tremendously weird, but also enormously unsettling. Angelo Badalamenti's score is less of a soundtrack and more of a droning, unnerving soundscape. Occasionally the episode delves into outright bloody horror. The absurdity of the old seasons is still there, but it does not feel remotely funny this time. This is a much bleaker, slower and more uncomfortable Twin Peaks. I think it is very important to acknowledge just how much time has passed, not for the characters of Twins Peaks but for its creators. Between seasons David Lynch has directed Fire Walk With Me, Lost Highway, Mulholland Drive and Inland Empire. 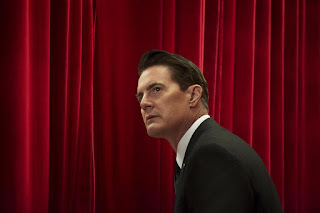 He has progressed into much darker and more challenging territories, and it would be foolish to imagine that wouldn't have an effect on Twin Peaks. Mark Frost, meanwhile has been writing screenplays about the Fantastic Four and golf (not in the same screenplay, mind). That, I will admit, I can't link up to the episode anywhere near as well as I can Lynch's more recent works. While it is great to see old characters again - particular Cooper - and the glass box sequence in New York is superb, for me the unexpected highlight is Matthew Lillard as high school principal Bill Hastings - a confused man charged with the South Dakota murder. You may remember Lillard as the fairly irritating one in such films as Scream, Thirteen Ghosts and Scooby Doo. He is incredible here: believable, naturalistic and immediately sympathetic. If he keeps the performance up, and continues to be a prominent character, I can easily see an Emmy nomination on his horizon. This is a dark, weird trip. I absolutely adored it. If Season 3 continues in this vein I strongly suspect 2017 may have found its best series.